As charming as Shabby Chic decor is, there’s something just a bit demoralizing about facing a white world inside and out, so when the snow starts to fly I’m drawn irresistibly to warm, sunny earth tones purely for their comfort factor. Domicile‘s newest skybox release, the Autumn, is in these shades of gold, orange and rich brown and is every bit as comforting as a cup of hot chocolate and a slice of pumpkin pie on a winter’s evening. Only 219 prims furnished, the 30×20 skybox has several seating areas with chairs and sofas that contain some of the most charming sit animations I’ve seen, including one with a book reading animation that cleverly dispenses a book to you for those long winter afternoons. There’s a fireplace, a bedroom (including a bed with sleep animations), and a picture window with curtains that open and close, as well as some really lovely artwork. 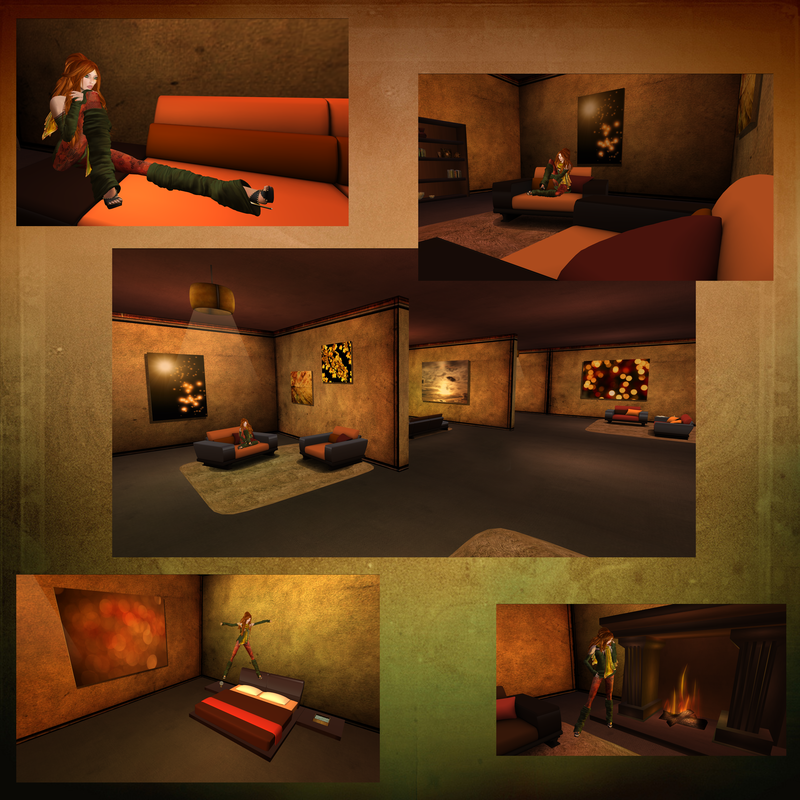 If warm and cozy is on your agenda, go give the rezzed copy of the Autumn Skybox up at Domicile a looky-see. The TP pad to the display skybox is right next to the Lucky Chair in the main store. Now here’s the sweetest part! The Autumn Skybox will be on sale for L$50 this Saturday, November 27th, for 24 hours only, from noon SLT Saturday to noon SLT Sunday, when it returns to its normal price of L$500. Bargain! And check out all the other great bargains while you’re there. Like the Christmas Garlanded Fireplace with lights and tree for only L$25. Or the always useful L$35 Crackhouse…. The Autumn is the first skybox, I’m told, in the Four Season series that designer Skell Dagger is planning. I can only say, for my part, that I can hardly wait for Spring. This entry was posted on November 26, 2010 by aebleskiverthibedeau. It was filed under Uncategorized .